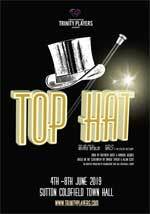 Following the tremendous success of Ladies' Day and Trinity Rocks, the Award winning Trinity Players returns to Sutton Coldfield Town Hall with its dazzling production of Top Hat. Step back into the glamour of Hollywood’s golden age and the glorious, tap-dancing magic of Fred Astaire and Ginger Rogers in one of the greatest dance musicals, staged in a special cabaret-style for the first time. Trinity Players takes this classic musical and brings it out onto the dance floor of the Town Hall ballroom. Packed full of Irving Berlin's greatest hits including Cheek To Cheek, Top Hat, White Tie and Tails, Let's Face The Music And Dance and Puttin' On The Ritz, Top Hat tells the story of Broadway sensation Jerry Travers who dances his way across Europe to win the heart of society girl Dale Tremont. Check out our Next Shows page to see what shows are in the pipeline to follow our current production.